Doomed for demolition, the city's newest Fabricland is a 16,000-square-foot emblem of an old neighbourhood on the cusp of fading forever. Most Fabricland locations are happy places: they are uniformly bright, clean, and sort of dull, like children who have grown up in households where good table manners trump creativity. 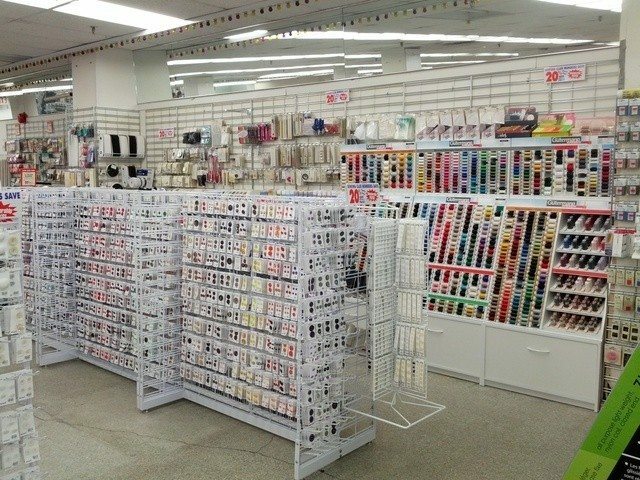 Toronto’s newest Fabricland—and at 16,000 square feet, also its largest—is located in the basement of Honest Ed’s, at the corner of Bloor Street West and Bathurst Street. Go past the kitchen supplies and the jumble of tiny gold Buddhas, and head downstairs to where the Polish cookies used to be. Now, there are rows of buttons, neon thread, and pink urethane cushions available for sale. If you’ve been inside any other Fabricland, you know what to expect: the lighting is fluorescent, the music is canned, and the fabric is plentiful. There are fabrics for clothings, for home decor, for handicrafts, for finishing touches. There are gossamer tulles and heavy brocades. There are fun furs and feather boas, a million different buttons, and the same depressed-looking knitting section that every Fabricland store offers. There are some surprises, like a quilting cotton printed with a map of the Canadian rail corridors and sleek examples of public transit (which gives the impression that Calgary might have a bullet train! ), and a huge roll of zebra-print fleece. The salespeople are friendly. The clientele is mostly women, mostly middle-aged. There are no windows. There’s a certain brio inherent in opening a store with a limited lifespan: this Fabricland will close at the end of next year, when Honest Ed’s vacates the corner block it has dominated for 67 years, and a new condo development moves in. We’re used to thinking of pop-up stores as being in service of the new and the hip, but this particular short-term tenant is trend-proof. The pattern books suggest items like blousy jackets that would look at home on the set of The Cosby Show, and wide-legged pants particular to the late-1990s raver style. Leafing through one of those books is like hopping into a time machine you have to assemble yourself. There are a few designer gems, like Rachel Comey and Donna Karan, but those require some serious digging to find. If it sounds like I’m being hard on Fabricland, I’m not. Growing up with an interior-designer mother, I spent more than my fair share of time wandering among the bolts of Stratford, Ontario’s Fabricland. (Fabric stores often rival hardware stores for places that are utterly uninteresting to children.) Fabric is the raw material of creativity: a seasoned eye can look at a bolt of fabric and see a couch, a new pair of pants, or a quilt. But these stores offer no toys and no books, and there are only so many patterned flannelettes one can fondle before even the most well-behaved child will slide onto the floor and throw a temper tantrum just for something to do. But adults seem to appreciate the whirr of a sewing machine. The Make Den and The Workroom are trendy and well-appointed places that regularly sell out garment-making classes. Their genius is that they offer the whole package: they’ll take you from the very beginning of a project to the very end, and hold your hand the entire time. The teachers are often bright and friendly young women who have made the DIY aesthetic into a marketable lifestyle. The Workroom is even a vendor at the City of Craft, offering curated pre-cut fabric bundles for at-home quilters. They fit right in among the artisans and the makers; the only difference is, they’re selling an out-of-the-box identity, one of a sewer who is thrifty and trendy at the same time. Shopping at Fabricland requires a bit more know-how. There are no classes at the downtown location, no stylish and seasoned experts to guide a beginner through the process of assembling an outfit. Fabricland’s wide array of products can help people decorate their homes and expand their wardrobes, but the average latte sipper simply may not know where to start. Things have become easier in the age of YouTube tutorials, but installing a zipper or ruching a dress isn’t for the faint of heart. Even experienced sewers might want a little hand-holding. Nearby, a Bulk Barn has taken over a former Sobey’s location, and there’s a relatively new Dollarama doing brisk business where Sonic Boom once sold records. There are a dozen competing sushi restaurants, all offering lunch specials that cost less than the price of a TTC day pass. Unlike Queen West and the up-and-coming Blansdowne area, where the tonier fabric stores and sewing classes are clustered, this part of town seems devoted to serving shoppers with thinner wallets. In that sense, Fabricland is a natural fit. That may change when the new Westbank Projects Corp. condos are built in the old edifice’s place. Glimpses of the future can already be seen in the hipster vegan bakery around the corner on Markham Street (punchily named APieCalypse Now! ), and on Bathurst Street at the Centre for Social Innovation, a co-working space that, according to its website, aims to catalyze social change. This demographic has an Etsy approach to crafting and making, and the bright lights and hands-off attitude at Fabricland may not win them over. It’s a pity: this store offers an affordable entry point for sewers, and some needed texture to the Annex retail strip.